Material & Size--Made of high quality and food grade stainless steel,polishing inside and outside, smooth surface, sturdy and durable,easy to clean,dishwasher safe.4.9 inches in diameter, stands 4.5 inches high. Detachable Strainer-- Insert the detachable screen when you need to strain out larger solids. You can reuse cooking oil, infuse vinegar with herbs and even brew your own beer.Suitable for filtering a variety of ingredients. Heart-shaped Indent-- Funnel\'s stem is equipped with an indent, actually it\'s the air release channel, which allows funnels to vent and allows contents to flow better then the round shape after many tests. Metal Ring--The metal ring is specially designed for storage, you can hang it on the wall and save space. Besides, while you pouring hot oil or other high temperature things, you can just hold the ring to protect your hands. 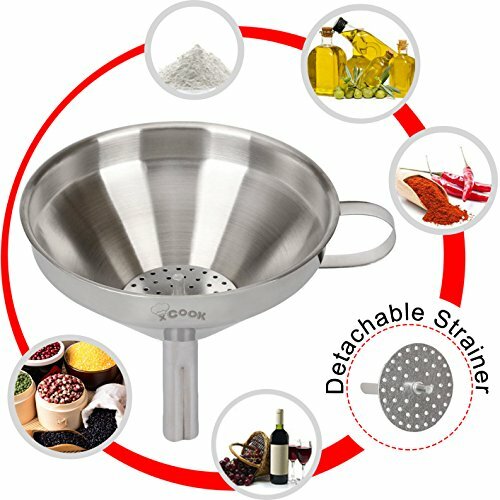 100% Satisfaction guarantee: XCOOK stainless steel funnel go through rigorous inspection and testing to ensure our customers receive a quality funnel. If for any reason,you do not satisfied with our products,contact us,we will replace it for you, no hassle! Or you will receive a full refund,no questions asked!